Naomi began practicing yoga in 2001, and immediately fell in love. Focusing exclusively on Ashtanga Vinyasa yoga at first, her practice gradually broadened to incorporate elements of other yogic traditions. From her very first class she knew that yoga was more than just a practice on the mat, but a way of life, an opening and awakening of the mind, and a vehicle to self-realization of the spirit. With over 600 hours of training in Ashtanga, Iyengar, Vinyasa Flow, Hot Vinyasa, Hot 26 and Yin Yoga, Naomi is also a certified instructor in Animal Flow®, an innovative quadrupedal and ground-based movement technique that emphasizes multi-planar, fluid movement. Naomi’s passion for combining movement with breath to create a moving meditation comes through in her playful yet challenging classes that interweave together the Yang and the Yin while focusing on maintaining the breath throughout and listening to the body, the teacher within. Suzie first discovered yoga in search of solace after the Sept. 11 attacks in New York City and was blessed to meet her lifelong teacher, the legendary master Sri Dharma Mittra. In 2008, Suzie, an elementary school teacher, enrolled in her first 200-Hour Teacher Training at the Dharma Yoga Center in New York City. After completing the training, she began her service as a karma yogi, and eventually began working and teaching at the Dharma Yoga Center, where she developed the Dharma Kids program and taught everything from basic courses to advanced asana classes. For years, she traveled with Sri Dharma, assisting him at workshops and retreats around the country. A lifelong student, Suzie has completed the 200, 500, & 800-hour Life of a Yogi teacher trainings with Sri Dharma Mittra. In 2014 she completed another 200-hour teacher training with Jared McCann, world asana champion and creator of JMY Vinyasa. She currently teaches and assists in developing the curriculum for the Science of Self Teacher Training program. Her experience spans numerous styles and lineages and she teaches all levels of practice. Suzie is certified to teach Dharma Yoga levels I, II, III & IV, Yoga Nidra, Psychic Development and Jared McCann Yoga. She is enduringly grateful to all of the gifted teachers in her life, most especially Sri Dharma Mittra, for his compassion, for teaching her the meaning of devotion and for guiding her to see the light in all beings. In the late 90s, while working in corporate America, Antonia’s mother sent her a Rodney Yee video with a note gently suggesting she try yoga. It didn’t take long before she was hooked. Her enthusiasm for her own yoga practice and her desire to share that with others led her to the teacher training program with Betsy Kase at Yoga Haven, where she received her 200-hour certification. She then went on to complete her 500-hour Advanced Certification with Shri Dharma Mittra. 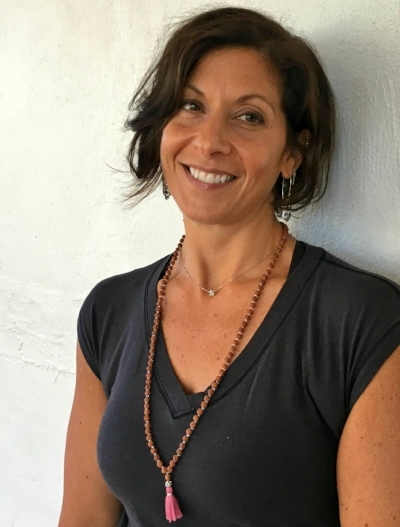 In addition to teaching, Antonia loves to learn, so she continues to study, and has earned additional certifications from Shiva Rea, Karma Kids yoga, and Janice Caulfied in Prenatal Yoga. Antonia is a firm believer in following one’s heart and embracing the fun and joy in life, both on and off the mat. A longtime devotee to Martial Arts and personal fitness, Byron discovered yoga by chance when a lower back injury left him close to immobile in 2012. He was introduced to the practice through basic stretches and techniques that allowed him to regain function and strength. Practicing on his own until 2015, he then began exploring communal yoga in studios and ashrams. His love for the practice only grew from there, as he went on to study various styles such as Vinyasa, Kundalini, Aerial and Hot Yoga. Later that year he traveled to Guatemala to complete a 300-hour 6-week Classical Hatha teacher training program at the Mahadevi Ashram, Lake Atitlan, Tzununa. The experience was profound for him and changed his insights to yoga completely. Since then he has continued his journey of yoga, teaching and practicing in various studios. He enjoys sharing his knowledge and experience with others so that they can enjoy the benefits of developing their own personal practice. Liane first fell in love with yoga about 5 years ago. The practice changed her life and mindset and she continues on her spiritual journey to finding her true self. Liane knew that receiving her 95-hour children's yoga certification at Yoga Synthesis in Chestnut Ridge, NY would be the perfect balance of her love for teaching children and her love for yoga. A school teacher of 9 years, she shares her practice with the children in the classroom and through a morning yoga program. Teaching children the importance of breath work, mindfulness, balance and taking care of their bodies are essential life skills. This certification not only deepened her practice, it allowed her to realize the impact it has on children and the development of self regulation and body awareness. Kids get stressed too and teaching them these life skills at such a young age is vital. She's excited to continue to share her love of yoga to help children cope with stress and daily pressures and find peace and love within. Oh, and to have fun while doing it! Billy initially took yoga as a way to help stretch out for athletics. Shortly after, he wanted to stop playing sports so he could take more yoga! He enrolled in the Azaya 200-hour teacher training program to bring the copious benefits of yoga to others. As a teacher Billy leads a dynamic yet mindful vinyasa and frequently mixes up his rights and lefts. He is currently studying nursing and hopes to incorporate elements of yoga into his profession one day to bring his patients more ease. When he’s not doing yoga or at school you’ll find him in the woods hiking with his two pups. Yoga was my last resort. Anxiety and stress was eating away at me. When I was practicing yoga, I was able to connect with God and reconnect with myself. I wanted to share that feeling with the world, so I became a certified yoga instructor. I enjoy teaching a free-loving vinyasa flow. I received my certification from the Jamie Surya Yoga Studio in Sparkill, NY. I am inspired by so many people, including my teacher and other instructors in the area, as well as rock stars in the industry, like Faith Hunter and Jessamyn Stanley. Ray began training as a second career in 2009, working at various gyms throughout Rockland County as well as offering private sessions. It wasn’t long before this second career became his passion. He remembers the great Jack Lalanne who believed anyone can exercise anywhere, anytime by using their body weight. Ray’s classes follow this approach, using body weight for resistance training, natural movement for cardio and incorporating core strengthening using the exercise ball.